That amount, following a successful 2017 and January, was the most the RNC has ever brought in for the month of February in a non-presidential election year. The $12.8 million figure is also nearly twice the RNC fundraising total for the February before the GOP took control of the Senate in 2014, $7.1 million. 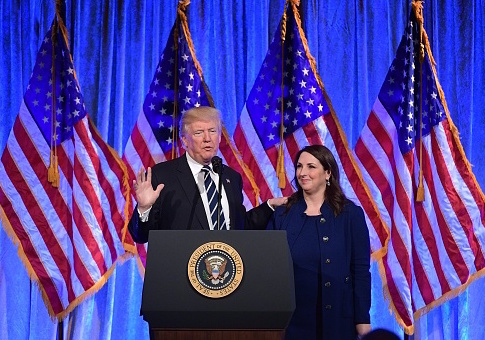 RNC chairwoman Ronna McDaniel owed the high fundraising numbers to President Donald Trump and the party's policies. "Thanks to the unwavering support of President Trump’s pro-growth agenda, the RNC continues to work with President Trump and Congressional Republicans ahead of the 2018 midterm elections," McDaniel said. "The RNC’s ongoing investments in a permanent ground game and data operation will help our Party win elections and keep Republican majorities as President Trump fulfills promises made to the American people." February's fundraising brings the RNC's total amount raised for the 2018 midterms to $157.7 million, with several months to go before the elections. As part of preparations for the 2018 elections, the RNC is fielding its largest midterm election field program yet and continues to hire staffers across the country. This entry was posted in Politics and tagged Fundraiser, RNC, Ronna McDaniel. Bookmark the permalink.